New numbers, including "Can You Feel the Love Tonight," from the Broadway show "The Lion King," and music from such rock groups as the Beatles, keep them on their toes. In the basement of Faith Lutheran Church in Syosset on a recent Tuesday night, a group of 20 or so men in candy-striped vests, white pants and red bow ties stand at attention. All eyes are on the conductor, but there isn’t a musical instrument in sight. Toes tap, bodies sway and heads bop as the chorus members sing a warm-up number titled “The Old Songs” in four-part a cappella barbershop. “In barbershop, there is no musical accompaniment; the voices are the instruments,” said Robert Miraglia, president of the Long Island Harmonizers, also known as the Nassau Mid-Island Chapter. 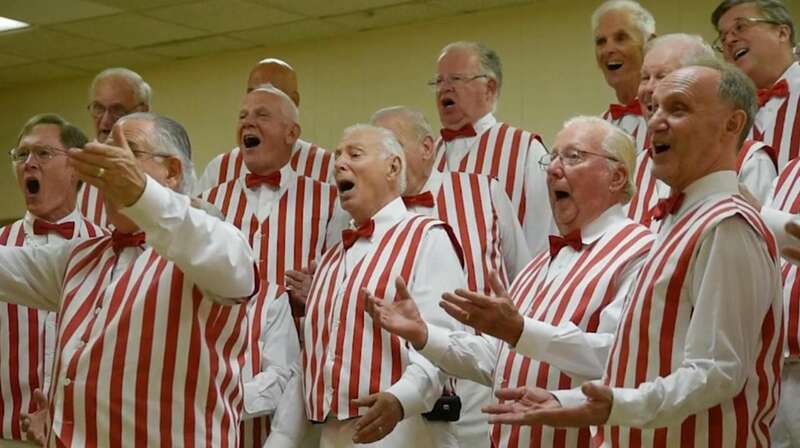 Founded nearly 70 years ago, the Harmonizers, Long Island’s largest chapter of the Nashville, Tennessee-based Barbershop Harmony Society, is an all-male a cappella chorus that performs traditional barbershop tunes. 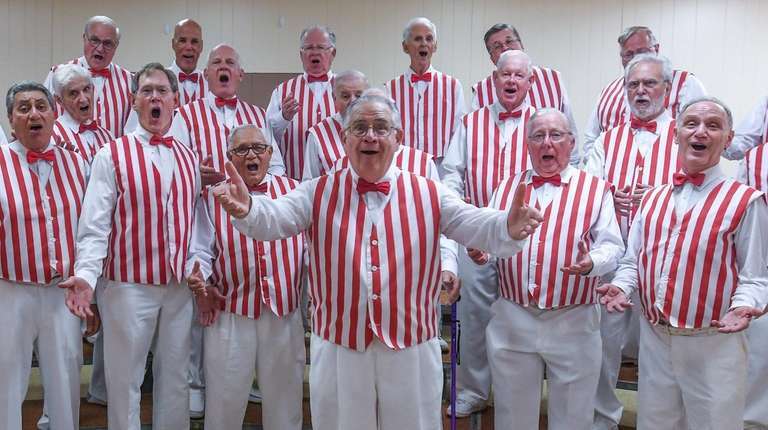 The barbershop chorus entertains audiences at a number of Long Island venues, including churches, libraries, street fairs, hospitals and parks and even once performed at Carnegie Hall in Manhattan. The chorus’ breakout quartets sing at concerts and at private parties, anniversaries, birthdays and Valentine’s Day for a fee. 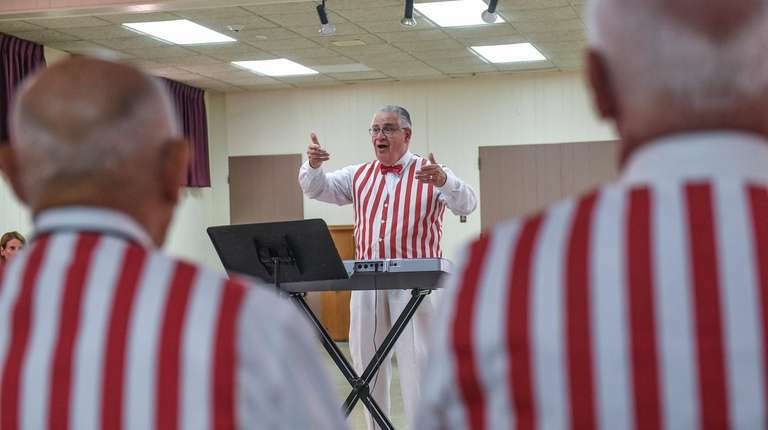 Barbershop singing is one of America’s oldest musical genres, said Jennifer Hart, adjunct associate professor of drama and dance at Hofstra University, who has managed the barbershop quartet at Disney World in Orlando, Florida. The chorus sings a variety of music, including show tunes, traditional songs and pop songs, averaging about 10 performances a year. For the most part, concerts are free, though tickets for its annual show are $15. For member Mark Head, 57, a former church cantor for two decades, learning music comes easily. Head, of East Meadow, who joined the chorus in February after seeing the group perform at a holiday concert in a hospital, said his mother taught him how to sing and read music as a child, “which is important when singing a cappella,” he said. Head may be one of few barbershop singers in the group who knows how to read music, said Debar. To help speed up the process of learning a new song, Debar said he offers members a CD with a rendition of the tune for each musical part. “You have to sing on pitch, and you have to have the desire to learn the part and study,” he said. But all that disciplined work is worth the effort, says chorus president Miraglia, since singing in a chorus improves health and wellness. And experts agree. “A number of studies have found that singing in groups boosts immunity by increasing salivary immunoglobulin [antibodies],” said Dr. Christopher Christodoulou, a clinical and research neuropsychologist at the Stony Brook Center of Excellence for Alzheimer’s Disease. Singing may keep the brain young. “One study found that people with dementia who participated in a singing program scored better on memory tests than those who did not,” he said. 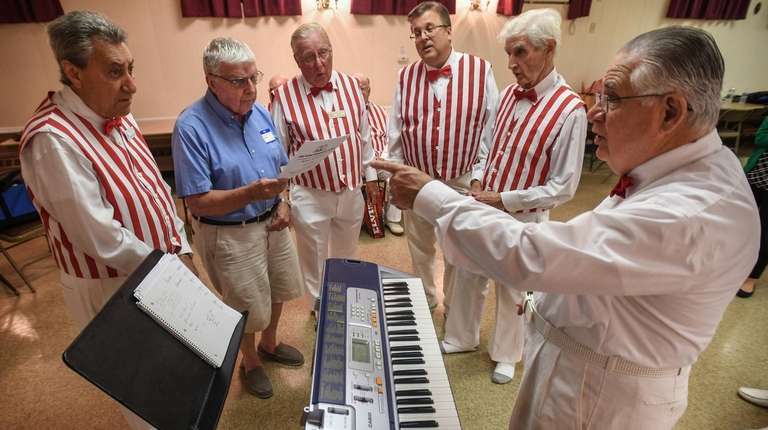 Member Ruth said the group has been a boon to his retirement years and he appreciates the social connections of the chorus. “Every Tuesday, four or five of us go out to a golf course in Suffolk to play, and we sing barbershop in the car on the way out and on the way home. People stare at us,” he said with a laugh. Debar said barbershop music “appeals to everyone at a certain time,” but acknowledges it generally attracts older audiences. One such fan, Kevin McNamee, 72, has been following the chorus for the past three years. He says he relishes hearing the familiar music his parents used to sing along to and especially enjoys the barbershop quartet. Festival is 10 a.m. to 4 p.m. The chorus performs from 1:30 p.m. to 2:30 p.m.
WANT TO SING WITH LI HARMONIZERS? Attend one of the chorus’ Tuesday night practices at Faith Lutheran Church, 231 Jackson Ave., Syosset, at 7:30 p.m. in the basement meeting room. Enter through the church’s back door. “We’re not looking for [Luciano] Pavarotti,” said Maurice Debar, the music director of the chorus, referring to the late Italian opera singer, “or superstar singers, you just have to love singing.” For more information, go to longislandharmonizers.org or call Debar at 631-587-8694.